Lately when I get up in the morning I find ice on the bird bath. During the day the temperature rises into the sixties and even seventies, so Ed and I have been able to continue our weekly hikes in the mountains. 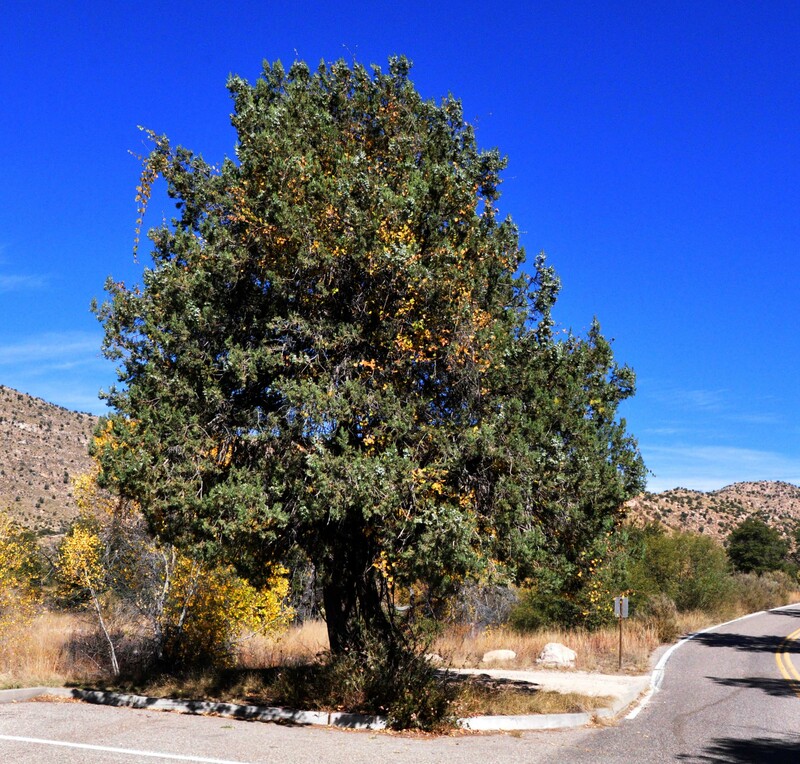 In November we parked the car and noticed yellow leaves in what at first looked like a single Alligator Juniper. 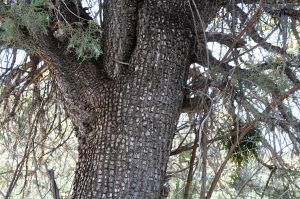 On closer inspection we found that there are two trees, very close together, so close that at one point their trunks merge into one. I looked near the top of the two trees and saw what appeared to be a branch from a Cottonwood, with bright yellow leaves. The nearest Cottonwood was about fifty yards away, so we doubted that it was a branch from it. We took out our binoculars and found that it was a grape vine. It was growing from very near the base of the trees, and extending over twenty feet to near the very top. The yellow patches in this picture are leaves of the vine in their fall colors. 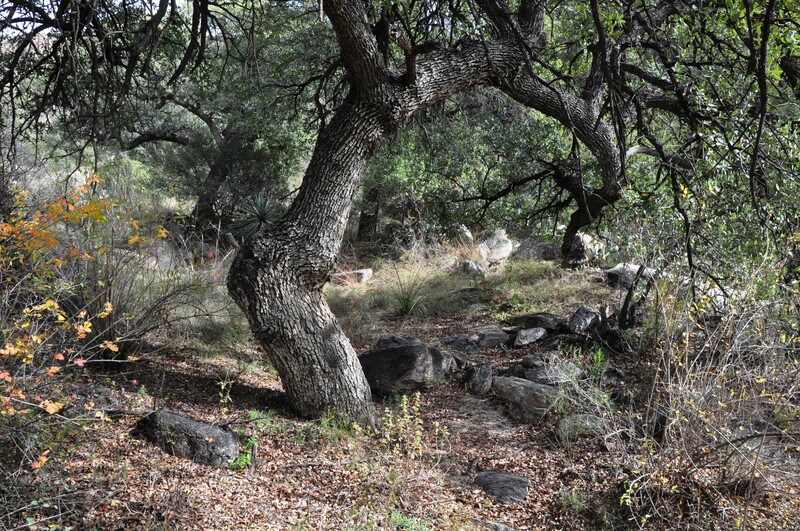 A week or so later we were walking in a stream bed, and admired this Mexican Blue Oak. Its growth is very much one-sided, probably because a major branch to the left has long since broken off. Further up we sat by a little stream, enjoying its pleasant sounds, and catching glimpses of various birds flitting in and out of the foliage. 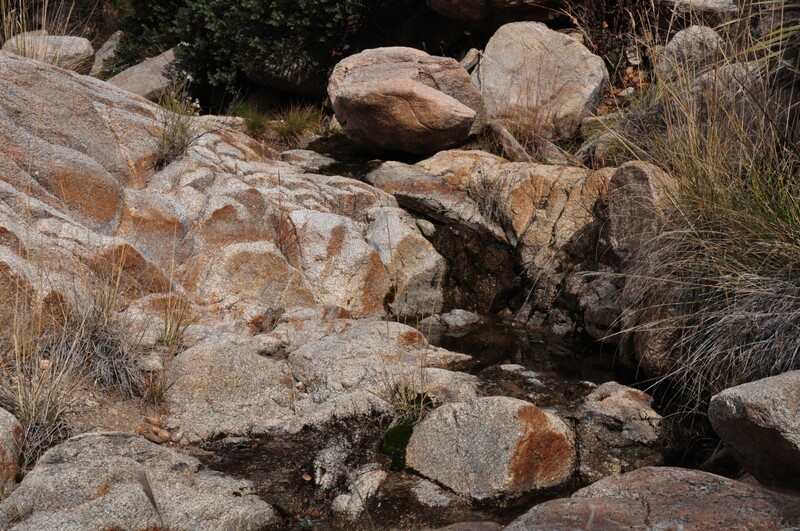 On a very much smaller scale, we saw a phenomenon that I had noticed in the Grand Canyon. One of the most noticeable rock layers in the Canyon is the Redwall limestone – five to eight hundred feet thick. I remember reading that the actual rock is a pale gray. The red color comes from millions of years of rust-filled water flowing down the surface. When my wife and son and I hiked down the North Rim of the Canyon, we could see freestanding Redwall limestone cliffs, and noticed that the horizontal surfaces at the top were not red at all but were pale gray. I pointed out to Ed that in this tiny gorge, the horizontal surfaces of the rocks were pale gray and the vertical ones various darker shades, especially of red. This was probably because of what is called Rock Varnish, a veneer that accumulates on rocks when wind blown particles stick to damp rock surfaces. The particles include iron and manganese oxides. We found the effect quite beautiful in this miniature landscape.